A Scottish appeals court Thursday upheld the conviction of a former Libyan intelligence agent for the 1988 bombing of Pan Am flight 103, which killed 270 people. It took less than a minute for presiding judge Lord Cullen to read the court's final verdict, reports CBS News' Lauren Comiteau. The five-judge court ruled unanimously that Abdel Basset Ali al-Megrahi, 49, was responsible for the bomb that brought down the Boeing 747 over Lockerbie, Scotland. "We have concluded that none of the grounds of appeal is well founded," said the presiding judge, Lord Cullen. "The appeal will accordingly be refused." Comiteau reports his wife broke down and was led out of the courtroom wailing. Families of the victims were also in tears, many hugging each other. Al-Megrahi was found guilty last year of loading an unaccompanied suitcase bomb onto a flight in Malta that was later transferred onto Pan Am Flight 103, which exploded en route from London to New York over Lockerbie, Scotland. 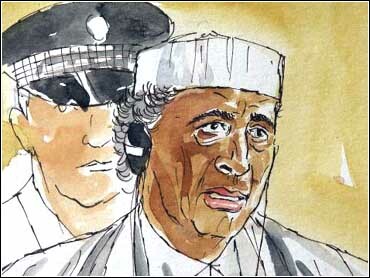 His alleged accomplice, Lamen Khalifa Fhimah, also a Libyan, was acquitted. "He killed 189 Americans, he killed 270 people, he blew up a plane. I think someone like that should never be forgiven," Susan Cohen of Cape May Courthouse, N.J., told CBS Radio News. Her 20-year-old daughter Theo died in the Lockerbie bombing. The president of the Libyan bar association, Hafid Jhoja, said the court had been swayed by political influence. "The trial was a political matter, not a legal matter. There was no clear evidence, as the whole world knows," he told reporters outside the special courtroom. "All the Libyan people, all the Arab people, are upset by this judgment," he said. The verdict will increase pressure on Libya's ruler, Col. Moammar Gadhafi, to pay compensation to the victims to remove sanctions imposed by the United States against the north African country. "This was not done by this agent of the government alone, this al-Megrahi," Cohen said. "He was a lower-level person, and this really was done by Gadhafi himself." In London, British Home Secretary Jack Straw said he hoped the decision would bring "solace and comfort" to the families, and urged Gadhafi to fulfill his obligations. In the appeal, which opened Jan. 23, al-Megrahi's lawyers argued there had been a miscarriage of justice by the lower court in weighing the evidence. Defense lawyers also presented new evidence they said should cast enough doubt on the prosecution case to overturn the conviction. Two new witnesses told the appeals court they found evidence of a break-in in the baggage area at London's Heathrow Airport hours before the Pan Am flight took off, suggesting that the bomb-laden suitcase could have been loaded in London rather than in Malta, as concluded by the trial court. The original trial, held in the same high-security courtroom on a former U.S. air base in the Netherlands, was presented to a panel of three judges instead of a jury. Prosecutors called 285 witnesses to compile a case of circumstantial evidence that al-Megrahi loaded the unaccompanied suitcase onto the Malta flight. The explosives detonated 38 minutes after takeoff from Heathrow, killing all 259 people on board and 11 on the ground in the village of Lockerbie. During three weeks of appeals hearings, defense lawyers sought to discredit the witnesses who identified al-Megrahi as the man who bought clothing in Malta that investigators said had buffered the bomb inside the suitcase. They also called Heathrow security guard Raymond Manly and his supervisor Philip Radely to testify that they found a broken padlock on a door to a restricted area where luggage was waiting to be loaded onto various Pan Am flights. Although the men told police at the time the break-in looked professional, they were never called to testify to the trial court. Defense lawyers discovered the evidence only after the verdict was delivered Jan. 31, 2001.